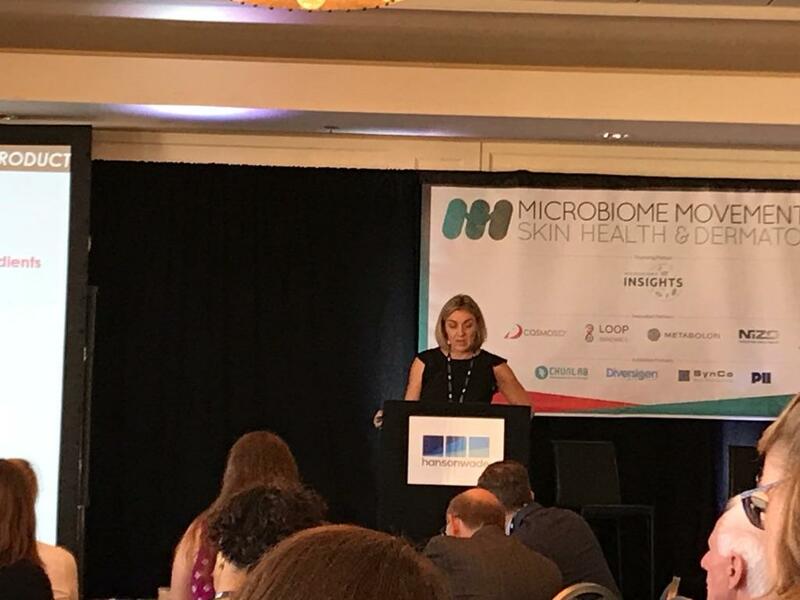 Microbiome Insights was a proud founding partner of the Microbiome Skin Health and Dermatology conference, a part of the Hanson Wade Microbiome Movement Series—held September 10th to 12th, 2018. The aim of this event was to explore ways of understanding the mechanisms underlying microbial interactions with skin health, and to discuss standardization of metagenomics research and how to develop effective products. Over 100 leaders in the skin microbiome field were on site at this exciting event. We’re pleased to present a summary of the highlights from both the pre-conference workshop and the two-day main event. The September 10th workshop, called “Harnessing the gut-skin-brain axis in health and disease”, was led by Lionel Breton, L’Oreal Advanced Research, Scientific Director. Breton spoke about what we know today regarding the connections between the skin microbiota, gut microbiota, and neurological disorders. Scientists are puzzling through these links, on the path to developing commercially viable therapeutics for skin health and brain health. 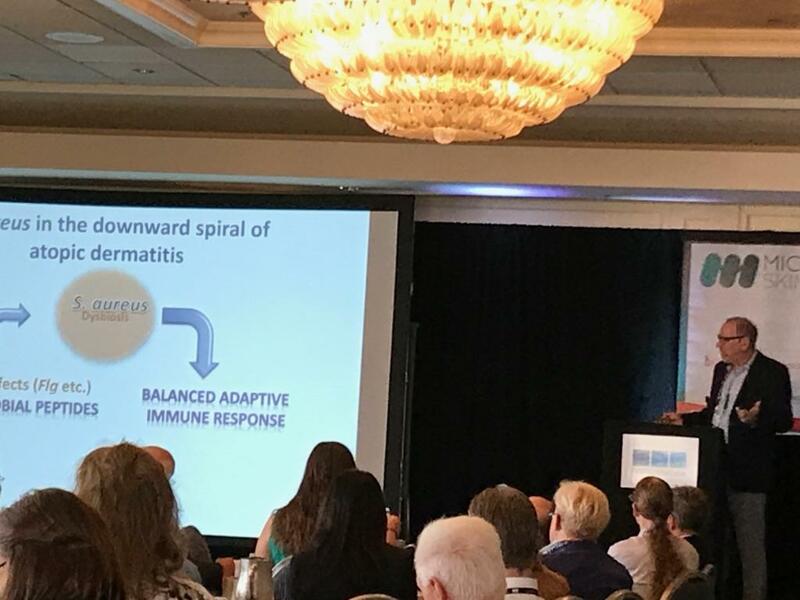 The first day of the conference began with opening remarks by Larry Weiss of Persona Biome: he acknowledged that the skin microbiome represents an exciting therapeutic frontier in dermatology, but encouraged the audience to be cautious and exercise humility—because after all, “we still don’t know what we don’t know”. Richard Gallo of UCSD then spoke about “Targeted Design of Microbial Biotherapy for Skin Disease”. Gallo began with an overview of how microbes relate to human health in general: he argued that researchers need to look at the ‘hologenome’, as it takes into account that human functions are based on genes that are expressed via microbes and the environment. Gallo turned specifically to the microbial life surrounding hair follicles on the skin. He noted that human follicles greatly increase the surface area of the skin; when the microbes in follicles were analyzed using 16S DNA sequencing, it appeared that most of the microbial DNA did not exist on the surface, but rather, it existed deep down in the follicle. A very small percentage of the microbes were further down, penetrating the fat and tissues under the follicle. The composition of the microbes in the fat was similar to that found on the surface. Gallo emphasized the capacity for systemic interactions linked to the skin microbiome, as the blood vessels on the skin can have extensive communication with, and impact on, the rest of the body. He gave the example of atopic dermatitis: not only do people with this condition have a higher abundance of Gram-positive bacteria (S. aureus) than other people, but Gallo’s work showed that they also have an immune abnormality that inhibited the development of antimicrobial peptides to fight the disease. The presence of S. aureus drives a Th2 immune response, which further decreases the antimicrobial peptides and amplifies the disease. So what appears to be a skin disease is actually a complex condition with systemic influences. Next up was a talk by Curtis Huttenhower of the Harvard TH Chan School of Public Health, a member of the Microbiome Insights Scientific Advisory Board. He presented on “Structure, Function and Diversity of the Healthy Human Microbiome”. Huttenhower began by explaining the phases of the Human Microbiome Project (HMP): while HMP 1 had the goal of identifying the baseline microbiota of a healthy cohort of individuals, HMP 2 included more multi-omics analyses, and had a longitudinal focus, aiming to uncover interactions in disease. HMP1-II was a recent follow-up on the HMP 2 data; it involved 300 people (half men, half women). Huttenhower noted that the field has seen great advancements since the kick-off of HMP 1, and argued that we are getting to the point where scientists can do meta-analyses to see which methods are more reproducible and reliable. Specifically related to the skin microbiome, Huttenhower said we have a long way to go—not only in characterizing the ‘healthy’ skin microbiome, but also in defining its biochemistry. Novel functionality is associated with certain strains. Ongoing work is looking at how the skin microbiome may be acquired in the first place, by examining mother-infant pairs. Initial analyses indicate the strains of most bugs on the infant do not originate from the mother. Julia Oh of The Jackson Laboratory spoke next, on “The Human Skin Microbiome: From Metagenomes to Therapeutics”. Oh emphasized the differences in composition of the skin microbiome, depending on body site: oily sites, for example, are very different from dry sites. She advised that when looking at therapeutics, skin microbiome researchers should consider factors like site specificity, diversity of the microbiome, and stability of the community. For instance, in those with atopic dermatitis, the skin microbiome looks different depending on whether you measure it at baseline, during a disease flare (when relative abundance of S. aureus increases), and post-flare. An organism that grows well on the skin—that is, on a graph of time versus growth, an organism that has a U-shaped trajectory (rather than flat). An organism that is beneficial to the immune system. Their group looked at T cells and measured the rate of MAIT activation with 4000 different species. An organism that is innate. Most skin sites are stable over time, so the challenge is integrating a foreign species into a community. Previous experiments show it’s difficult to get something to colonize on the skin. The set of talks was rounded out by Microbiome Insights CEO Malcolm Kendall, on the topic: “From Swab to Data: Considerations for Designing Skin Microbiome Studies.” He emphasized looking at skin microbiome studies from many angles: study design (including the power), collection, stabilization, transport, sequencing, and analysis. He noted the in-house work of Microbiome Insights that investigated the total DNA as well as the microbial content while using swabs versus tape for a skin microbiome sample. Results showed little difference in total DNA content across systems, but higher microbial content (less host content) on premoistened swabs. Of course, this approach is useful for skin surface microbiome but may not be the best method to look at the follicle microbiome. Kendall says he has noticed a lot of debate surrounding the variable region that will provide the most fruitful information for skin microbiome analysis using 16S. Microbiome Insights has done some internal R&D work to address this issue: the outcome of which is a new ‘V4_skin’ primer that provides better species-level identification of skin taxa while maintaining low error. An intriguing panel discussion was held later that morning: “Where will the Skin Microbiome Need Standardization to Advance Science & Future Products?” It was led by Huttenhower, joined by Amanda Nelson of PennState. Participants emphasized the problem of contamination, since skin microbiome samples have a low microbial biomass; researchers need to include positive and negative controls for ‘human’ and body site. The panelists covered the relative advantages of different collection techniques, sequencing techniques, and culture libraries. For bacteria and skin fungi, libraries are improving, but viruses change so quickly that they won’t be covered in reference libraries. Integrating different data (using multi-omics analyses) will lead to better insights. In the afternoon of day one, participants heard from Huiying Li of UCLA, on “The Human Skin Microbiome in Health and Disease”. Li spoke about acne in particular: they found individuals with acne and those with healthy skin had significant differences in the facial microbiome at the strain level; there are genes that are differentially expressed. Later, Pieter Dorrestein of UCSD moved the topic to metabolomics—he spoke about “Microbial Metabolites of the Skin Microbiome – Identifying Skin Chemistry to Search for Function.” He described how his group is taking several hundred swabs from the bodies of two individuals and translating the mass spectrometry data onto a 3D model—with the ultimate aim being to find the origin of the molecules. A combined metabolomics and 16S analysis showed no changes when the face and arms were treated with certain personal care products; however, there appeared to be a deodorant-dependent change in the armpit skin. In general, it appears that the profile is resilient, but that certain lifestyle factors can indeed impact the skin. 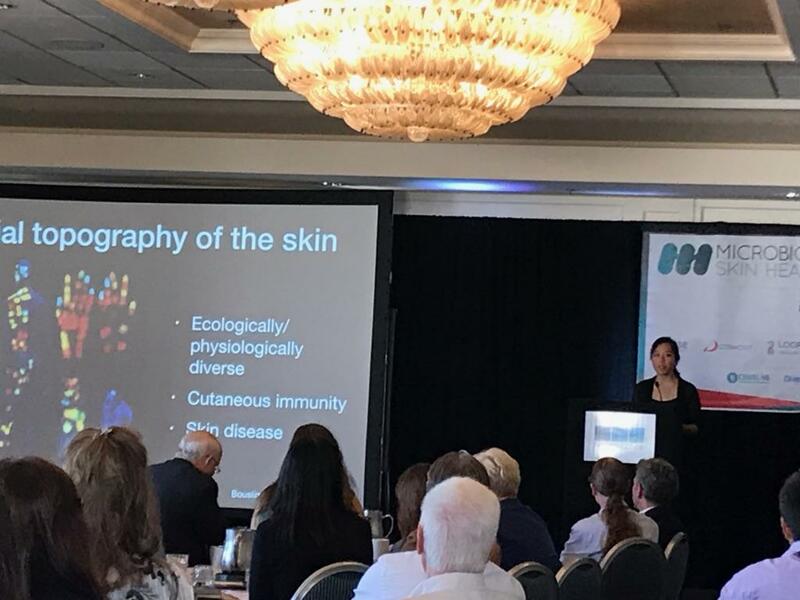 The second day of the Skin Health & Dermatology meeting featured another great lineup of speakers addressing different aspects of the skin microbiome. Amitabha Majumdar, Senior Research Scientist at Unilever, presented on “Commercializing Microbiome-based Beauty & Personal Care Products”. Finding the right target: In looking for the cause of malodour, the company found certain microbes, molecules, and pathways that were responsible; when they had the right target, they developed products (like Dove deodorant) to address the problem. Hitting a target better: In terms of acne, Majumdar says they found that lesions were reduced after a particular 3-week treatment that included natural oils. The company then took two natural oils that were part of this treatment and added them to two facial products already on the market. ‘Rebalancing’ the microbiota: One of the company’s toothpaste products were studied clinically—and they found that after 14 weeks, some of the bacteria associated with oral health were altered. Majumdar’s talk was followed by one from Alex Goddard, VP, Research & Development at AOBiome: “Using Ammonia Oxidizing Bacteria to Restore Healthy Skin”. Goddard started with the premise that we are being deprived of certain metabolites because of the nature of our hygiene practices, and this may be altering our overall immune system and general health. He reported that David Whitlock, one of the company founders, noticed animals like horses roll in the soil to relieve an itch on the skin. This led to an investigation of whether the soil somehow had a therapeutic effect—and to the potential of ammonia oxidizing bacteria. These bacteria produce nitric oxide (which is anti-microbial and anti-inflammatory). The company’s general approach is to discover new environmental bacteria that can be used on the skin. Goddard cited some of the challenges in developing new therapeutics: determining mechanism of action (whether direct or indirect); dosing; and variability in patients (from a physiological and microbial standpoint). Then, Livia Zaramela, postdoc at UCSD, spoke on “The Role of the active Microbiome in Skin: Emphasis on Atopic Dermatitis”. Zaramela addressed the connection between food allergy and atopic dermatitis, as about one third of children with atopic dermatitis have food allergy. Their group uses a multi-omics approach to identify whether food allergies are intrinsically linked to atopic dermatitis or not. Zaramela discussed how to overcome the challenges of low biomass samples for metatrascriptomics analysis: they maximize collection, extraction, and mRNA enrichment, and they work to minimize contamination. In terms of contamination, it’s necessary to reduce human content in the samples, but also reagent contamination. Moreau described how the company is looking at the skin microbiomes of women of all ages. At four different skin sites across two age groups, the distribution of Staphylococcus appeared to change significantly, while the proportion of Cutibacterium at each site decreased with age. Diversity was higher in the older group, across all sites. Thus, the trend with aging seems to involve a decrease in sebum and an increase in skin microbiome diversity, with some oral bacteria increasing on the skin. She then addressed how to translate this growing microbiome knowledge into products. Approaches include fostering the growth of beneficial bacteria, controlling the community metabolites to bring back ‘equilibrium’, or perhaps using the virome for precision modulation. Stephen France, Business Development at SkinBioTherapeutics, was the next speaker, on “Harnessing the Power of the Microbiome for Skin Health.” He focused particularly on some interesting observations on lysates (i.e. fluids containing the contents of lysed cells). They found lysates could inhibit pathogens and change the skin barrier; pretreatment of the skin with lysates protected against S. aureus invasion. Hillebrand began by describing the company’s investigations into the meaning of skin health, with input from 70 individuals. The resulting points were: “it has to perform, but needs to be resilient when stressed; it needs to look even color-toned, and fairly unremarkable (you don’t notice your skin)”. Hillebrand described the company’s ‘Cinco de mayo’ study, done in collaboration with Microbiome Insights. Skin samples from the forehead and cheek were taken from 150 Amway employees (aged 20 to 60) in 2017, with a repeated measure on 137 of the individuals in 2018. They measured other parameters like elasticity. Microbiome analysis using 16S V4 and V1-V3 revealed overlap in the microbial communities of the forehead and cheek, with some differences. Individuals’ skin microbiomes were relatively stable, and the individuals who had low diversity of their skin microbiome in 2017 also had low diversity the following year. Barrier function was stronger with a more diverse skin microbiome; as water loss went up, barrier function went down. The other striking finding was that bacteria from the genus Corynebacterium increased with age. Amway is looking to build on these findings, with Microbiome Insights acting as an external R&D arm, to rapidly develop microbiome-focused solutions for skin health. Vancouver, British Columbia (September 12, 2018)—Microbiome Insights, Inc. is pleased to announce that it will receive a contribution of up to $190,249 from the National Research Council of Canada Industrial Research Assistance Program (NRC IRAP) to help support the development of a new personal health platform of microbiome testing. Co-founded by Drs. Brett Finlay and Bill Mohn at University of British Columbia in 2015, Microbiome Insights is a rapidly growing company and a global leader in microbiome testing and bioinformatic analysis. The advisory services and financial assistance from the Government of Canada, through NRC IRAP, will help the company expand in a new direction—continuing to develop tools for use in clinical settings as new data emerge on the gut microbiome and health. See the original BusinessWire press release here. Competition for funding can be tough—but if you’re applying to a Canadian granting agency to fund a microbiome study, the Microbiome Insights team will be pleased to help. Some granting agencies require you to name an industry partner—and as the leading Canadian industry partner dedicated to microbiome testing and bioinformatic analysis, we are positioned to help your application be as successful as possible. Here are some frequently asked questions about how we can help with microbiome research grant applications in Canada. What kinds of testing does Microbiome Insights do? Microbiome Insights has a full suite of sequencing options—some of which may not be readily available at your own institution. Our services include amplicon sequencing (16S V4, 16S V1-V3, 16S V4_skin, 18S, ITS2 and Archaeal V4-V5), shotgun metagenomics, and bacterial whole genome sequencing; in addition to sequencing we run short-chain fatty acid analyses and calprotectin testing. If these are relevant to your research, please contact us for more information on pricing, turnaround time, and support. Feel free to include our details in your grant application to show you’ve got everything lined up and ready to go for your research. How flexible are the services? While an end-to-end service is appealing to some, it doesn’t suit everyone. We can provide the full end-to-end service if needed or we can provide only the parts that make sense to you: for example, if you’re interested in learning more about bioinformatics yourself, you can obtain raw data from our team and explore the data on your own. Under this model, you’ll be able to leverage our wet lab standards while continuing to grow your own understanding of the microbiome. Everything we do it price sensitive, so we have the ability charge per sample rather than having you lock into a full plate or a full run. How can partnering with Microbiome Insights make the grant application stronger? Including us in your grant applications shows you have strong collaborators and leading expertise on your side, bridging to the knowledge of our team and our co-founders (Drs. Brett Finlay and Bill Mohn). Through us, you’ll be able to secure expertise and support in the areas where you need it, and you’ll be able to access industry standards and proven pipelines. Moreover, you can be assured that all of this is done in Canada, with leading Canadian experts in the field. What specific assistance can the Microbiome Insights team offer for grant applications? We’ll consult with you to better understand (and draft, if necessary) the study design. We can give you guidelines on collection and transport to insert into your application, and can provide a mock report of the results if required. Our team members can also be hired to write a detailed results or methods section for your application. Most importantly, we also offer a letter of support which details your study objectives, our deliverables for services and reporting, along with workflows and pricing. These details are key features of your submission, and we are always able to edit the details as funding is released. How many Microbiome Insights clients come from academia? The majority of our clients at present come from academia and publish their results in leading journals. If you choose to partner with us, you’ll have access to the same exceptional team that’s used by well-known researchers worldwide.